Over the years, my first aid kit has morphed, getting bigger or smaller depending on my level of optimism. 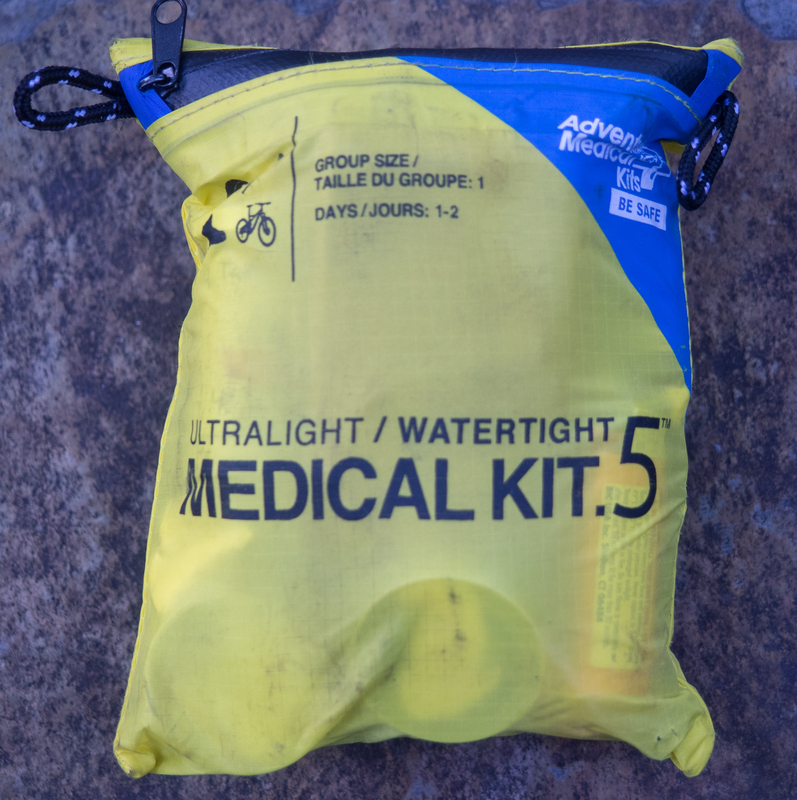 I’ve carried big kits with everything plus the kitchen sink, and minimalist kits consisting of a few aspirin and a roll of tape. After decades of fluctuation, I’ve finally settled on a largish kit (at least by climber standards.) It has supplies in it that allow me to deal with some of the more common backcountry injuries: blisters, cuts, abrasions, bleeding, and pain. In addition to the first aid supplies, I have materials to start a fire and repair fabrics. A small leatherman tool and a small emergency flashlight provide some functionality for repairing and fixing things, cutting, and vision after dark. 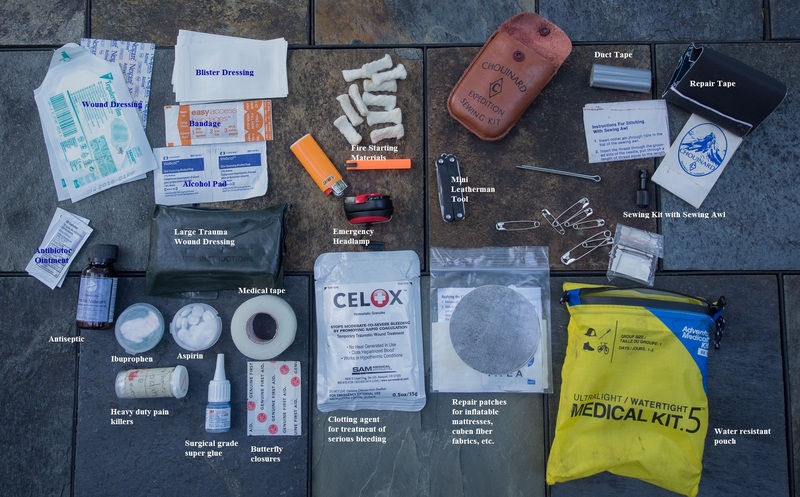 I carry this kit with me pretty much any time I head into the backcountry. I’ve used everything in it at one time or another. Here’s the contents of my current standard kit. Total weight is 13.3 ounces. First aid/emergency kit, with contents labeled. Hiring a guide is somewhat uncommon here in the United States. Very few US climbers that I know have ever climbed with a guide. This is in contrast to Europe, where guided climbing is much more common. Hiring a guide can be an excellent experience. A good guide will not only guide you up a route, but will also teach you skills that will carry over to unguided climbing going forward. Because you’re working with a company as opposed to an individual guide, it may be difficult, for example, to retain the same guide if you want to undertake guided climbing in Grand Teton National Park, Mount Rainier, and Rocky Mountain Park. Because of the concession restrictions, you will likely be forced to use three separate guides, one for each location. Regulations are a bit more relaxed outside of national parks, but many federal and state lands regulate guiding activities. It is often the case that some sort of commercial permit is required to legally guide on public lands. The reason usually given for these restrictions is the need for quality control. Personally, I think that this justification is somewhat lame. I participated in a guided class in a national park that was attended by a park ranger who was there to “audit” the guide service and assess whether or not their guide permit should be extended. It was abundantly clear that the auditing ranger knew little or nothing about climbing. Unless somebody died during the class, it would have been pretty much impossible for him to draw any valid conclusions as to the quality of the services provided. However, government oversight of some sort isn’t necessarily a bad idea. This is because, in the United States, there is generally no requirement that a guide have any formal training. This is in stark contrast to Europe, where every professional guide must complete a very rigorous, multi-year program in the guiding profession. In Europe, the UIAGM (or IFMGA depending on the language) is the body that must certify an aspiring guide. Without this certification, a person can not legally guide in Europe. In the US, they regulate real estate agents, lawyers, and hair dressers, but anyone who wants to can call himself a guide. However, although certification is not mandatory in the United States, some guides do go through a certification process. In the USA, the equivalent of the UIAGM is the American Mountain Guide Association (AMGA.) The AMGA provides training and certification for guides. However, not all certifications are equal. The AMGA provides training and certification in a number of climbing disciplines, including “Certified Single Pitch Instructor”; “Certified Alpine Guide” “Certified Climbing Wall Instructor.” These various certifications clearly involve widely varying degrees of competence and expertise. So, it’s not enough to simply know that your guide is AMGA certified. It is much more important to know exactly what disciplines that the certification applies to. There are very few US guides who are certified across all of the AMGA disciplines. To make the situation even more confusing, guide services are often referred to as “AMGA accredited.” However, this doesn’t mean that all of the guides at that services are certified. Don’t take this to mean that American guides are unqualified. There are many good guides in the US, regardless of certification. However, the lack of consistent requirements means that you need to do more homework when checking on your potential guide’s qualifications. So, when compared with Europe, the situation in the US manages to be both more complex in terms of regulations, and yet less transparent and consistent in terms of guide qualifications. With regards to costs and booking procedures, North America also differs significantly from Europe. In North America, you typically reserve a guided trip some time in advance, and you pay a fixed fee by the day for the guide’s time. Travel expenses, food, etc. are extra. Differing guide companies have different policies regarding refunds, so it makes sense to ask what will happen if your climb is cancelled or cut short due to bad weather or other circumstances. Depending on the situation and policies, they might refund your money, might offer to reschedule, or you could just be out of the money. The profession of guiding, and the process of hiring a guide is quite different in Europe than it is in the United States. First, as already mentioned, European guides must be certified by the UIAGM. If you hire a mountain guide in Europe, you can be assured that he/she has undertaken a very rigorous formal curriculum in guiding. Second, in Europe, any certified guide can guide pretty much anywhere in Europe. There are no “concessions” like in the US. You can climb with the same guide in Chamonix, Zermatt, and the Dolomites. Third, the fees are calculated differently in Europe. In contrast to North America, where a guide’s fees are typically a fixed daily rate, in Europe, the fee is dependent on the route climbed. Generally, the longer and more serious the route is, the higher the fee. As in North America, expenses (typically hut fees, and teleferique costs) are the responsibility of the client. One advantage of the European system is that you typically don’t pay for days not spent climbing. If you’re climbing out of your guide’s home base town and the weather is bad, you won’t pay for days spent trapped in town by bad weather even if you’ve made reservations to climb with him. Unless you’re requiring your guide to leave his base of operations, if you don’t climb due to nasty weather, you typically don’t owe anything. Similarly, if the climb is aborted due to sickness or other such event, you’ll only owe a reduced fee for a single day. Overall, I much prefer the European approach to guiding. It makes it much easier to develop a long-term relationship with an individual guide, and it’s much more flexible. Also, because of the requirement for universal certification, you can be assured of a uniformly high standard of competence when hiring a guide in Europe. I’ve hired a number of guides, in the U.S., Canada, and Europe. Here are some observations about getting the most out of hiring a guide. Selecting a lesser traveled route will endear you to your guide. Most areas have a number of “trade routes” that are climbed with monotonous regularity by guides. Choose something else,or better yet, collaborate with your guide to choose a route. The lesser known route will be less crowded, the experience will likely be more enjoyable, and your guide will be excited to be doing something new. Be honest with your guide regarding your abilities, and don’t get in over your head. Your guide isn’t there to drag you up a climb that you aren’t technically capable of climbing. Remember, your guide isn’t Superman. He’s trusting his life to you just as you are placing your life in his hands. You have a responsibility to look after his safety that is not any less than his responsibility to take care of yours. Similarly, just because you’re being guided, you can’t give up responsibility for your own safety. Continue to exercise independent judgement, and don’t turn your brain off just because you’ve got a guide with you. Observe your guide carefully. 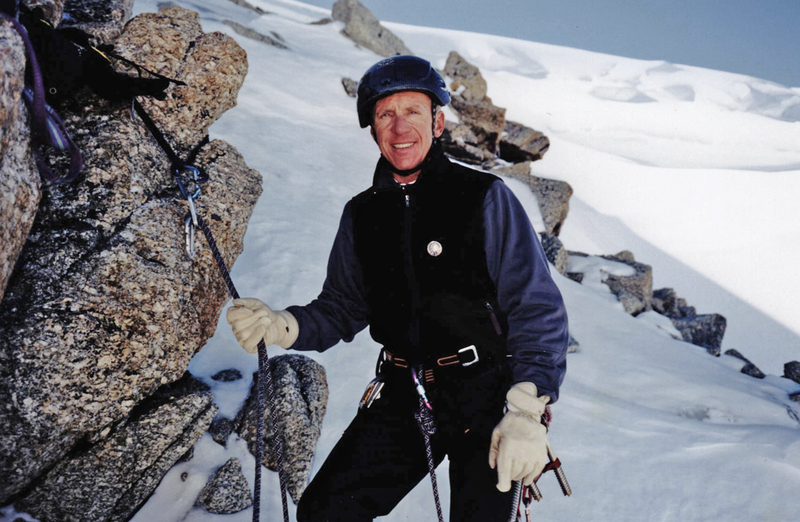 Watch the way he uses his crampons and ice tools, how he climbs rock, what clothing and equipment he favors. Examine the paths he chooses, how he places protection and belay anchors, the way he manages the rope, how he moves, etc. Ask questions as time and circumstances allow, but don’t waste too much time with questions while on the mountain. Make a mental list of questions to ask him after the climb is over and you’re relaxing in a restaurant having a post-climb feast. This is a great opportunity to learn how an expert climbs. Take advantage of it. 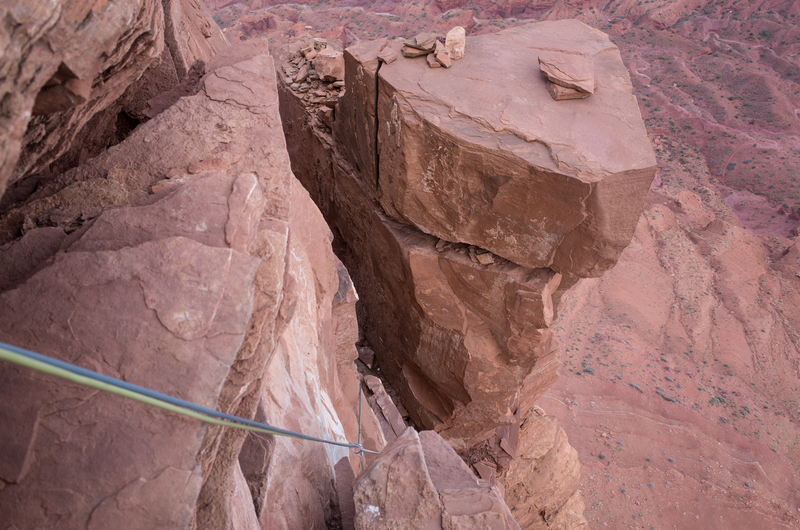 There are advantages to hiring a guide that is local to the area that you’re climbing at. This is particularly the case in Europe. A local guide can often get you on the very first cable car in the morning, the best spot at a crowded hut and other perks of local knowledge and connections. Lastly, don’t be afraid to find another guide if your experience with a particular guide is less than you had hoped for. I’ve never had the misfortune to climb with an incompetent guide, but I have climbed with a guide that was a poor fit for me and my personality. We just didn’t have much fun when we were in the mountains. 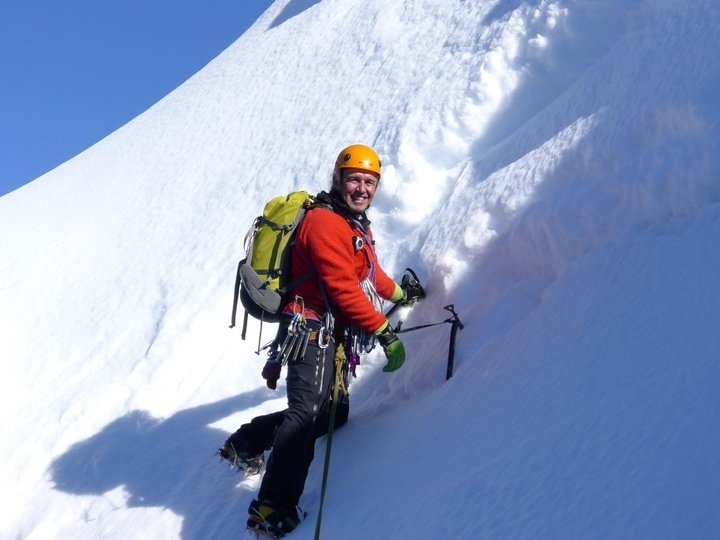 Luckily, I’ve found a number of guides that have been terrific, particularly my Chamonix guide, Franco Obert, a wonderful man with whom I have shared some of the best days of my life. 1: Snickers Bars, cheese sticks, and pepperoni are the foundation of mountain climbing nutrition. 3. Always bring more than one pair of gloves with you on an alpine climb. 4. Bring lots of 6 mil cord for retreating and improvising anchors. 5. 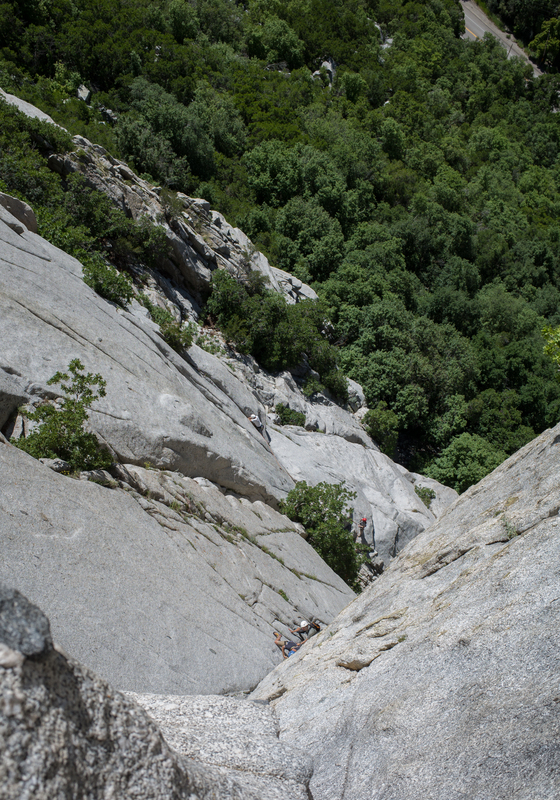 Not all alpine climbs have to start at 2:00 a.m.
6. Coiling your rope in a mountaineer’s coil makes it a lot easier to carry when wearing a pack.